The Circus is coming to town! (Okay, it actually arrived the other day). Ringling Bros and Barnum & Bailey presents Barnum’s FUNundrum playing at the Quicken Loans Arena from October 20-25. Ringling Bros. and Barnum & Bailey® is roaring into town with Barnum’s FUNundrum!SM, a new jumbo-sized, un-miss-able event celebrating the 200th anniversary of the birth of legendary P.T. Barnum, the Greatest Showman on Earth! From the moment that you arrive, the momentum explodes as The Greatest Show On Earth® comes to life in a way that can only be inspired by the greatest showman who ever lived. 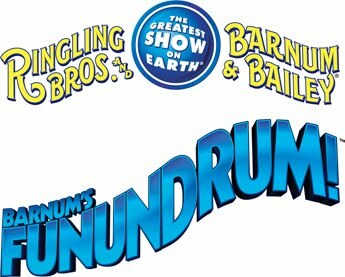 At Barnum’s FUNundrum!, the funtastic and funbelieveable experience answers the FUNundrum! so get your tickets today before this train leaves the station! If you are planning a trip to the Circus, I have a coupon code for you to get a discount. I'm disappointed to be missing the Circus this year, as it doesn't fit into our schedule. Both of the kids had such a great time last year when we went. No compensation was received for this post. Information was provided by Feld Entertainment.